Unsung Heroes | Families for HoPE, Inc. In our journey with HPE, there are many people who make a difference . . . but there are some who are quiet, unsung heroes. . . those whom we can never thank enough, yet we owe them the world. I’d like to recognize my mom as our hero. She raised me to be a strong, independent woman, and it came in handy when I was handed a grim outlook for Mia. She laughs with me, cries with me, and supports me through thick and thin. The staff at CCCDP in Raleigh. They are the team for children with hearing impairments at UNC-CH. Even though they had never seen a child like Cayden & had no idea if his brain could even process sound, they took a chance & were not afraid to try. As a result, his life changed drastically with the addition of hearing and his personality blossomed. ← March 10-16 is Holoprosencephaly Awareness Week! These stories are so great. 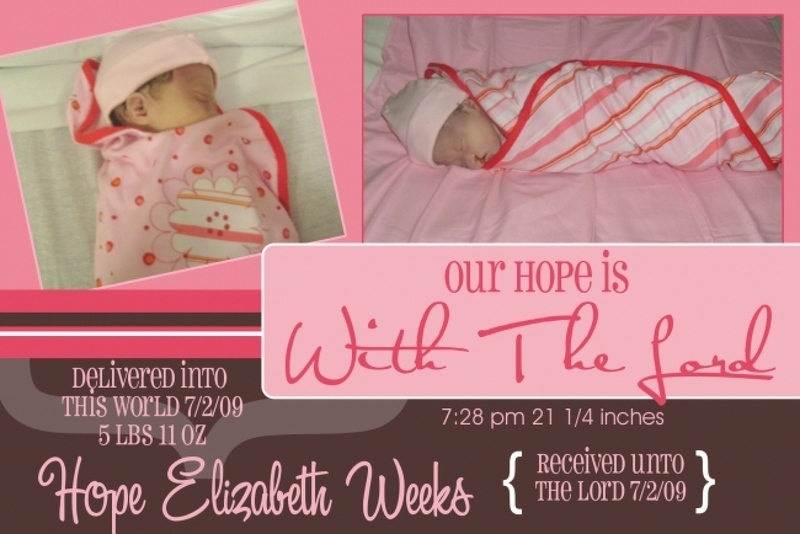 My little Angel Hope Elizabeth was fortunate to go straight to be with the Lord, and her big sister. She is missed, but we love her so..